It is very plain it is the most basic Civic you can get but I think it is the best! My Honda Civic is very reliable it is got 250000 miles on it and it still runs like it is new it did however need new brakes new bushings in new struts it is never ever left me stranded it is very basic it has an m fam cassette everything works on it is comfortable it is the most basic Honda Civic that you can buy but it is a great car it is always been reliable it is had a bit dead battery couple times but that is not the car it is the battery I would recommend this card to anyone especially kids high school college people who need to get places on time and get there for sure I cannot say enough how dependable this car has been. Even though it's a little car its go a lot of legroom. I recently got new brakes, replaced the windshield wipers and it is very comfortable and a smooth ride it gets my husband and I to all our errands just fine and I even believe its safe enough to put my grandchildren in it to bring them to our place for the weekend and trips to the park just fine. Why just recently we took our car on vacation to AZ from WA. Without a hitch not one problem gets very good gas mileage also and our trunk held all our belongings with plenty more room to spare I really wouldn't trade this car for anything but I really would like a truck to go garage saling. Thank you angle weatherly. 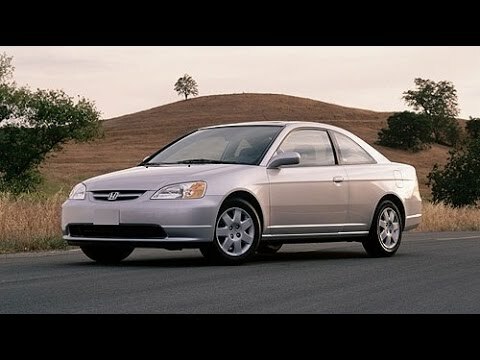 Honda civic 2001- no nonsense machine. For the most part I haven't had too much trouble with my car. I bought an aftermarket water pump and it ended up blowing my head gasket because it wasn't properly cooling. Point: use Honda specific parts when fixing problems. It gets great mileage so thats been a money saver. It's a 17 year old car and about two years ago the lining on the inside started going. It's a nice nonsense car. Not flashy but mostly reliable. I replaced the stereo because it wasn't compatible with iPod. The car does not have any super fancy features (Bluetooth, nice radio, etc. ) But its reliable and keeps my gas costs low. On certain sedans, a small amount of water may have been left in the fuel pump electrical connector after testing. This residual water could cause the fuel pump to fail due to corrosion. If the pump stops working, the engine will stall without warning, increasing the risk of a crash. Dealers will inspect the fuel pump. If corrosion is found, the fuel pump will be replaced. The manufacturer has reported that owner notification began June 29, 2001. Owners who do not receive the free remedy within a reasonable time should contact Honda at 1-800-999-1009. Some sedans and coupes fail to comply with the requirements of Federal Motor Vehicle Safety Standard No. 209, "Seat Belt Assemblies." Certain rear seat belt buckles were improperly manufactured. The rear seat belts will work properly and provide protection in a crash, but the owner may experience difficulty unfastening the belt after the crash. Only buckles that are marked (on the back side of the buckle) with an assembly number beginning with 00185, 00186, or 00187 have the problem. Dealers will inspect the vehicles and replace the seat belt assemblies that were improperly manufactured. The manufacturer has reported that owner notification was expected to begin during January 2002. Owners who do not receive the free remedy within a reasonable time should contact Honda at 1-800-999-1009. On certain sedans and coupes, the hose clamps on the filler neck tube have insufficient clamping force. In a collision, the tube could disconnect from the fuel tank, resulting in fuel leakage. Fuel leakage, in the presence of an ignition source, could result in a fire. Dealers will check the hose clamps for proper torque and tighten them correctly, if necessary. The manufacturer has reported that owner notification began June 29, 2001. Owners who do not receive the free remedy within a reasonable time should contact Honda at 1-800-999-1009.